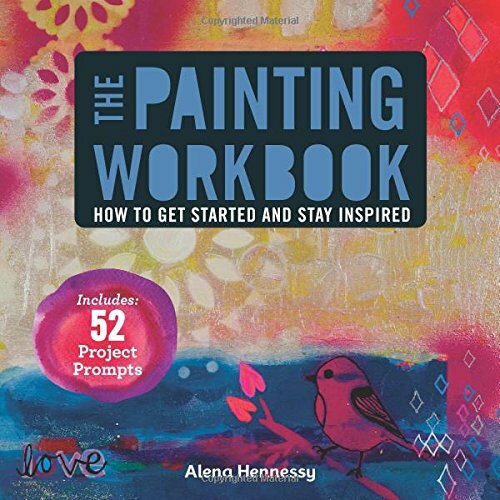 The Painting Workbook authored by Alena Hennessy is for beginners and anyone looking to start creating art with paint. The book starts with the tools you can use for painting, explains the art principles briefly, talks about some simple techniques and moves on to the 52 project prompts. The art principles really brief. Each principle is explained in one line and then there's a caption for an images that illustrates that principle. This is certainly not a book for in depth art theory. It's really a starter guide. Highlight of the book are the 52 projects featured. They are actually themes that you can use for your paintings. It can be design-based such as using single colours, silhouette, patterns or subject based like drawing landscape, the sun, or techniques-based like using your finger, etc. There are some mini-demonstrations of techniques mixed into the 52 projects. That would be the hands-on part of the book. They are not complicated. However for many of the accompanying examples to the projects, I can imagine beginners will have difficulty replicating what they see. But anyway, this book isn't about techniques so beginners can take it easy, just have fun and paint. The Painting Workbook is a fun project book for casual painters and beginners. Intermediate or advanced artists looking for inspiration are going to find this book to be lacking. If you want to paint, I highly recommend you check out Daily Painting: Paint Small and Often To Become a More Creative, Productive, and Successful Artist as well, and maybe Just Add Watercolor: Inspiration and Painting Techniques from Contemporary Artists. Both very inspiring books.